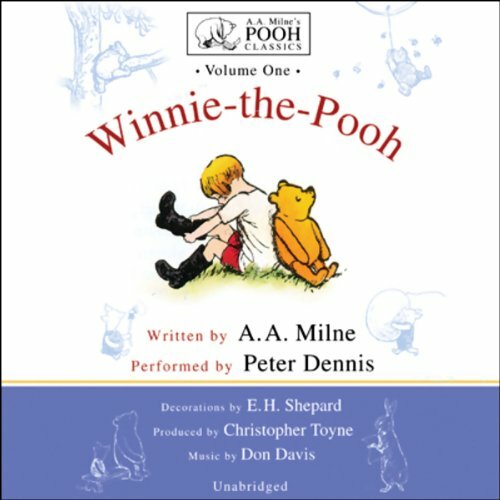 Blackstone Audiobooks presents, from the unabridged collection A.A. Milne's Pooh Classics, the 10 stories of Winnie-the-Pooh performed by Peter Dennis. This is the only reading of these immortal stories authorized by A.A. Milne's son, Christopher Robin, who wrote, "Peter Dennis has made himself Pooh's Ambassador Extraordinare and no bear has ever had a more devoted friend. So if you want to meet the real Pooh, the bear I knew, the bear my father wrote about, listen to Peter." All the material is unabridged and taken from WINNIE-THE-POOH Copyright 1926 by E.P. Dutton & Co. Inc., Copyright Renewal 1954 by A.A. Milne. All material Copyright under the Berne Convention. Recorded by permission of The Trustees of the Pooh Properties. Illustrations by E.H. Shepard copyright as above and used by permission of the Estate of E.H. Shepard. Color Illustrations ©1991 Dutton Children's Books. I downloaded this one one day when I was feeling blue and thought something lighthearted and fun would cheer me up. I felt a little silly doing it because I don't even have children to use as my excuse. I soon found that I had chosen well. Both the content and the reading had me laughing out loud and left me smiling long after it ended. I could wish it was a bit longer but I guess I'll have to download more Pooh books for that. I think we all remember these stories from reading them to the children or TV adaptations but Peter Dennis does the most wonderful job of bringing Pooh and all his friends back into our adult lives that this trip down memory lane is the best I have taken for some time. I have listened to the stories again and again and always with a smile on my face and the occasional chuckle out loud. Listen and enjoy. This is a must have for any family with children 3 years and above. The stories are wonderful and voiced so well. You cannot help but laugh aloud each time Piglet talks. Great fun for all! Replayability? Definately... requested almost nightly by our boys. At last. Winnie-the-Pooh as it should be read. It's hard to believe that Mr. Dennis does all the voices himself. A remarkable performance. I think I get as much, if not more enjoyment out of these recordings than my nieces and nephews. A truly brilliant rendition of these wonderful stories. This is by far the best audio version I've heard of Winnie-the-Pooh. Peter Dennis as narrator gets the characters just right; the music is just enough to add to the delight, without distraction; and the warm tone set by the narrator is incredibly inviting. [The real-life Christopher Robin - AA Milne's son - says Peter Dennis re-creates the characters as his father intended - and as he grew up hearing them.] Public Radio ran this Blackstone Audio version as a series some years ago, and I fell in love with it then. I'm thrilled to now share it with my preschooler. Be aware that the other version offered by Audible (the "dramatized" one) doesn't have any of these characteristics - I found it quite grating, and the characterizations were all wrong. The Peter Dennis version is perfect! Ten stars would not be enough. Peter Denis is unsurpassable in delivery of this beautiful witty book which is by no means only for children. For me, it was always its sweet philosophical melancholy that has been drawing me in. The wise fool Pooh. Adorable character worth to be followed. Now I remember the real story! Beautifully read, now I remember why I loved reading this book to my children many years ago. Piglet is wonderful! I think the grown-ups in the car enjoyed this one even more than the kids. The narrator's version of piglet was really delightful. Perfect for all ages. It may be that I have heard Alan Bennett's reading of Pooh for 15 years and I am used to it, but I couldn't get past this reader's voice for Pooh, Christopher Robin and Piglet. At that point I stopped. We needed to replace our Alan Bennett tapes and I couldn't find new ones so I thought this would do. I realize Pooh is a bear of very little brain, but the reader not only gives him no brain at all, but makes him sound like a brainless old man with a sore throat. It is a voice much more suited to Eeyore. Christopher Robin sounds much too old and Piglet gives a little farty noise (that is supposed to be an oink) every time he speaks. That said, the reader's plain narrator voice is very good. As that was the only sample audible gave, I thought that I would enjoy the rest of the voices. I'm off to find another Alan Bennett. 32 sur 39 personne(s) ont trouvé cet avis utile. All Things Pooh Are Possible! Peter Dennis takes you by the hand and walks you straight to the heart of the 100 akre woods from which all things Pooh are possible. Walk, don't run with Peter through every scrumptuous word ever written by A.A. Milne about the bear that belongs to everyone, Pooh! great for kids where engl. is 2nd lang. + great stories, fit for a wide age range of kids. + excellent & clear speech. great for kids where engl. is the 2nd language. - one has the feeling, with intro., music etc., that the Audiobook is a bit "stretched". + all in all, not far from the 5* rating. worth buying, esp. with the monthly credit.